Operation Disciplined and Intentional is in full swing, and I just need to tell you that my body is in protest. Seriously. Apparently, it forgot what it feels like to be exercised. I, apparently, forgot how uncoordinated I am. Yesterday morning, I woke with full intentions of starting the day with my Pilates DVD. I lasted about two minutes before I remembered why I stopped using the video in the first place: I'm terrible at getting all my parts moving in the right direction at the right time. I spent most of the two minutes craning my neck up at the TV from the floor wondering how on earth I was going to get my body to do that. I picked up my hand weights and did some arm and ab exercises, then I did crunches and called it a morning. Those 250 crunches did a number on my belly. It's been screaming at me ever since. After Micah woke up and ate breakfast, we packed up and headed to town to pick up a few essential items, including a new workout DVD. I tried it this morning, and although it was difficult, it's at least doable for me. Last night when Dennis got home, I laced up my running shoes and hit the road. 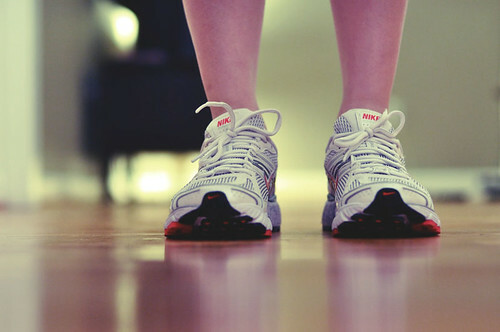 I'm following a simple 5K running plan, and I'm hoping that this time it sticks. I haven't run in over two years. My last semester at Beeson, back in 2008, is the last time I remember running. Then I got pregnant, had a baby, and couldn't figure out when running was supposed to happen anymore. After the failure of yesterday morning, I thought there was no hope for the running adventure, but then I surprised myself by completing all 10 minutes of running without too much trouble. It felt good to run again. Have I mentioned that I'm out of shape?? The plan is to work out each morning at home, either with my weights or with a DVD. When Dennis gets home in the evenings, I'm headed out the door for 30 minutes of running/walking. My goal is to do the videos 5 days a week and run 4-5 days a week. At the end of 10 weeks, I should be able to run for 30 minutes without stopping, which will put me on track for running a 5K sometime in the spring. I've just got to find one. So that's my workout plan. What about you? How are you working out these days? I don't generally make New Year's resolutions. I usually have a vague sense of a goal or two that I would like to accomplish during the year, but this year is different. I've been living a bit haphazardly lately, letting schedules slide and allowing situations dictate my days. Last week, I read a post about resolutions on Bloom that helped me clarify a theme for 2011. In the post, Danielle chose one word to define the upcoming year. Her word was gumption. As I mulled over all the different goals I have for this year, two words came to mind: disciplined and intentional. Since I graduated from seminary and became a working from home staying at home mommy, I've lost a lot of the discipline that defined my life when I had four papers and three books to read each week. That lack of discipline has filtered into all sorts of areas of my life, and I'm ready to reclaim it. That explains why I chose disciplined as one of my theme words. My reasons for choosing intentional are a bit different. Being a mother has forced me to question why I do the things I do. I want to raise a daughter who is thoughtful and mindful, which has forced me to become more thoughtful and mindful about how we do life in this household. I want to be intentional about the things we watch, the books we read, and the traditions we practice. I'm not interested in living haphazardly any longer, but I am interested in intentionally cultivating a sense of wonder and faith in my baby girl. That process starts with me. Those words are my themes, and I've got lots of ways I'd like to see the words define this year. My list of goals runs from losing 25 pounds to paying off student loans to rising each morning with Dennis. I want to read the Bible using M’Cheyne's Bible Reading Plan and start a bit of Bible-reading with Micah. I plan to post more frequently, run a 5K, and sign up for more writing projects. I also want to read more books (which should be easy since this year I only finished one) and live more generously. Being disciplined and intentional will help me accomplish all of these things. I am resolved to be a disciplined and intentional woman this year. Saturday I had a nervous breakdown. As soon as I sat down on my chaise lounge with my journal and Bible, I felt my face crumpling and knew that I was about to have a full-on-uglyface cry. It was not pretty. Let me go ahead and confess that last week I didn't get up before 7 a.m. a single time. Well, maybe once. The rest of the week, I dragged myself out of bed around 7:15 or 7:30 because I was so. very. tired. I'm talking the kind of tired where you just want to crawl into the bed and pull the covers over your head and stay that way all day long. Have you ever been there? I was there. For the past 361 days, I have been solely responsible for Micah's nourishment, and for 361 days, I have been looking forward to the day when she was weaned so that I could just sleep in on a Saturday morning while someone else worried about what she would eat for breakfast. There we were, just one week away from her very first birthday, and it was my first opportunity for someone else to take complete responsibility of her in the morning. Except I never communicated that to my wonderful husband. So when he didn't magically read my mind and know that I wanted him to get up and take care of her just for a little while, I had a little breakdown. I felt the anger and bitterness rising up inside of me, and I counted down the minutes until it was time for Micah to nap. I laid her in the crib and went straight for the bedroom, where I secluded myself and bawled for almost 30 minutes. Not that Dennis knew about any of this. He was busy working his tail off to get our deck finished up before Micah's birthday party this week. It was not his fault. It was just easier to blame him for my morning not working out the way I wanted than it was to deal with the real issue. The real issue is that I'm tired. Very, very tired. I've been working like crazy over the past several months, and I have taken absolutely no time to rest. When Micah naps, I work. When Micah goes to bed at night, I work. Sometimes I work while Micah plays on the floor at my feet. I work, work, work, juggling taking care of Micah and taking care of my business, never stopping to take care of myself. 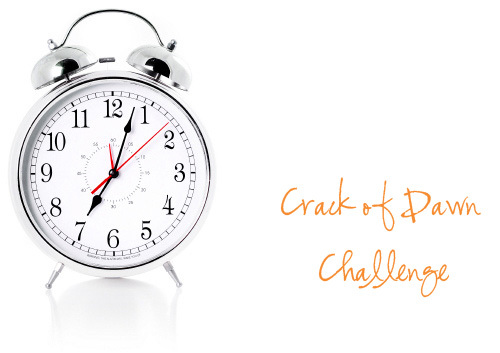 I started this challenge because I recognized the need for a major change in my routine. My priorities had become ridiculously skewed off-center, and my obsession with being perfect in all areas of responsibility has kept me from taking some time just to enjoy the amazing life that God has blessed me with. I had gotten into the habit of cramming Bible-reading and prayer into Micah's naptimes, and I honestly chose not to do it more often than I should have simply because there were so many other things screaming for my attention that I had to accomplish while she slept. Since I have begun this challenge, I have spent almost an hour of time alone with God every single morning. I may not have made it up at 6 a.m. yet, but I am very proud of the progress I have made so far. Life is much better when I start the day with some time with my Savior. Much, much better. I've found that just a taste of peaceful time to myself every day has made me crave it. I look forward to that time, and I have a feeling that this challenge, no matter how difficult it is for me in these early stages, is the beginning of a new lifestyle for me. It's worth getting up for. I'm pretty sure that Saturday's breakdown was a bout of growing pains. It was God prodding me, letting me know that something has to give if I really want Him to restore my parched soul. Real rest, Sabbath rest, is absolutely crucial for spiritual growth. I think I need some Sabbath in my life. So after I cried and prayed and cried some more, I wrote in my journal, read my Bible, and ditched the plans I had to complete work on an article that was in-progress. Instead, I soaked in the tub, talked with my sweet husband, told him how I was feeling, and took the afternoon off while he took care of our daughter. I didn't do a single bit of work over the weekend, and it was so very nice to simply rest and enjoy the company of my little family. I feel much better now. As for this morning, you'll be proud to know that I got up about 6:45. It's slow-going, but it is going, and that's what matters.